Many companies have caught onto the trend of Matcha and have chosen to include Matcha green tea as an ingredient in their products. 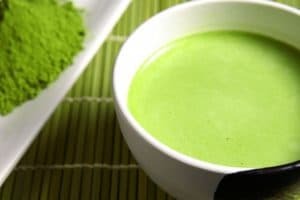 Is it true that Matcha green tea is legitimately healthy and benefits can be proven through analysis? As expressed in our Matcha health benefits section, Matcha green tea is packed with many natural reasons to enjoy on a daily basis. AOI provides 100% natural product. Nothing has been added or taken away. So yes, Matcha is a naturally health ingredient and scientific analysis is available upon request. Is Matcha Soluble or Insoluble? Matcha is a powder that has been ground down to 5 microns (the size of talcum powder). And thus is not, by itself 100% soluble. But the use of an emulsifier or complementary ingredient can solve these challenges. Many beverage producers use said complementary ingredients to remove the grit or sandy texture of the tea in blended drinks. What is the stability of nutrients at high heat? Another common concern is its natural sensitivities. Matcha is ground leaf, and thus is a naturally living product. As with all natural herbs, plants, vegetables, etc. at a certain temperature nutrients start to die off. When using Matcha in baking, it’s suggested to add the ingredient in after the high heat stage of the process. As with green tea chocolate, Matcha is usually added in at a later stage. This also helps to keep the vibrant color intact. AOI offers Chlorella for baking; an essential ingredient used in the baking process to retains Matcha’s vibrant green color after baking.